After two months’ preparation, Bodun has successfully set up a new B2B e-commerce platform at Alibaba.com in May 2015. 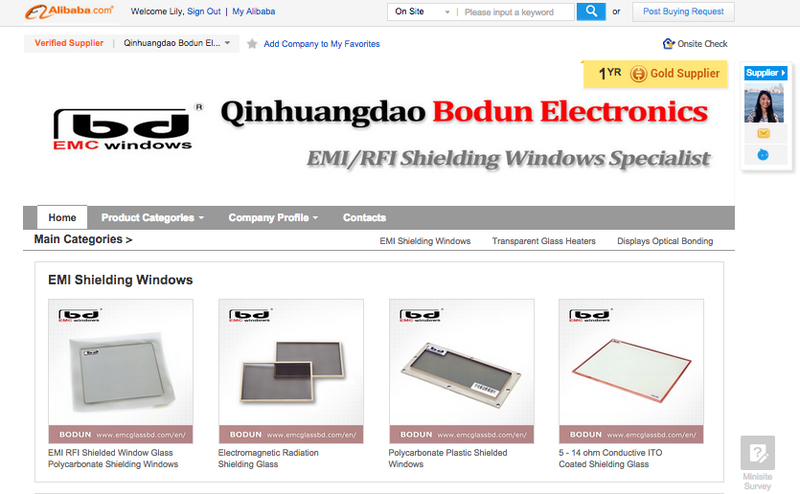 All main products of the company, including EMI/RFI shielding windows, transparent glass heaters and sunlight readable optical bonding, will be well displayed and sold through the online store to customers from all over the world. This open online platform provides more opportunities for brand and products promotions as well as good communications with potential clients. It makes a strategically important move for Bodun expanding into international markets. Alibaba.com is a global business-to-business web sales portal of Alibaba Group – the world’s biggest online commerce company. With its fast growing, the transactions on its online sites totalled $248 billion in 2013. Alibaba.com connects 7.3 million manufacturers and suppliers with buyers from 190+ countries and regions, simplifying the grueling process of sourcing new products. Bodun has been verified as the Gold Supplier of Alibaba.com after the whole process of authentication and on-site check. Other services, such as Alipay and Trade Assurance have also been activated for the payment security. We are dedicated to providing our clients with high-quality products and professional services. Please visit: http://emcglassbd.en.alibaba.com/ for more information.